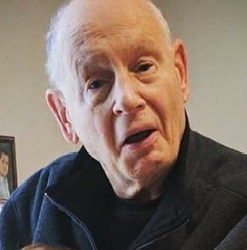 Obituary for George J Culp | McIlvaine-Speakman Funeral Home LTD.
George J. Culp, 79, of Washington, died Friday November 9, 2018 in Manor Care, McMurray. He was born July 26, 1939 in Mahoning Township, Montour County, a son of Walter and Mary Elizabeth Garner Culp. Mr. Culp was a graduate of Collingswood High School and Lehigh University. He had worked as a railroad engineer for Conrail in Pittsburgh and SEPTA in Philadelphia. Mr. Culp volunteered for Guild for the Blind in Washington. He enjoyed scuba diving, golfing and cross-country skiing. Surviving are: his wife, Eileen Davie; a daughter, Jennifer Beebe of Washington; three grandchildren, Kyle Duff, Corie Duff (Jeremy Fleeher) and Garrett Beebe; and one precious great granddaughter, Paisley Fleeher; a brother, Jim Culp (Linda) of Canonsburg; a brother-in-law Gary Shelton; and several nieces and nephews. A sister, Judy Shelton is deceased. At the request of the deceased there will be no services. Arrangements have been entrusted to the McIlvaine-Speakman Funeral Home Ltd., Robert K. McIlvaine, Owner/Supervisor, 27 Cherry Ave., Houston, PA 15342.